Jon Matlack, who just celebrated his 64th birthday on Sunday, began his major league career with the New York Mets in 1971. A 15-10 record with a 2.32 ERA in 1972 earned Matlack the National League Rookie of the Year award. And in 1973, he was an important part of the starting rotation for the National League champion Mets. Matlack was a three-time All-Star for the Mets from 1974-76, but after a disappointing season in 1977 where he finished the year with a 7-15 record and a 4.21 ERA, the Mets sent him to the Texas Rangers as part of a four-team blockbuster deal. 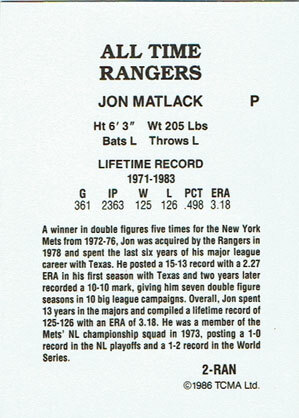 Matlack rebounded to win 15 games and lower his ERA to 2.27 in one of the best seasons of his career. However, he was never equaled that success again and only one more season where he pitched 200+ innings in the major leagues. In 1986, TCMA Ltd. produced a 12-card set of former Texas Rangers players. In addition to Matlack, the checklist also includes future Hall of Famer Gaylord Perry and another 1970s Met – Lenny Randle.